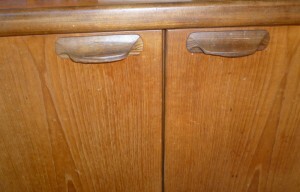 The handles on this G Plan unit were broken off, so they have been sent away to have FSC sustainable teak replacements made. 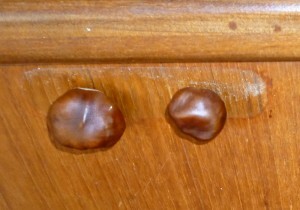 In the mean time I have screwed these conkers from oak trees onto the doors, using the same screws that attached the original handles. This also stops the screws from getting lost. It looks quite good, perhaps there is a future in eco hybrid furniture, using actual unworked things from nature? We have a friend who uses old tea bags leaves for pillow stuffing. True! 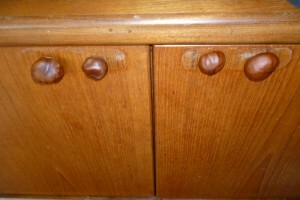 2 Responses to "G Plan furniture new handles, FSC teak, oak conkers, eco, DIY interior decoration, refurbish, remodel"
I’m so happy to read this. This really is the kind of manual that needs to be given and not the accidental misinformation that’s at the other blogs. Appreciate your sharing this very best doc. Many thanks we like to help all builders, that’s why we added the Spanish language pages.